Locker room furniture offered by PROMAG S.A. allow to furnish in aesthetic and functional way social rooms in factories, schools and sport facilities. Modular design, interesting colors and a variety of accessories will furnish even the most unusual spaces. Our offer can meet the needs of the most demanding customers. 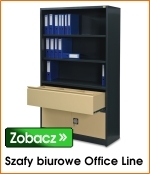 quality, PROMAG S.A. furniture were honoured with prestigious "The best in Poland" title and "Hipolit" prize in 2010. The range of dressing rooms furniture not only includes metal lockers, but also chairs, tables and benches, which perfectly complement the offer.